It was one of those moments that always stays with you. I was 17 years old. It was early in the morning --- I was on a field trip with a handful of other seniors from a high school history class. We were traveling west on Route 20 through northern Illinois just west of Rockford. I had a window seat in the third row of our rented van. The rising sun was behind us and was over the horizon just enough for me to see it emerging into that early morning: an old red barn with the words "To God be the Glory" shingled in white on its otherwise green roof. I have seen it many times since that first time, but I just happened to be driving that same highway again this last week and I remembered then the feeling that welled up inside me that early morning so long ago when that barn first came into view. For at that point, for me this journey of faith was particularly lonely as it can be for many young people --- no doubt, this is even more true today. There were not many places, at least not among my peers, where matters of faith were acceptable to talk about and honestly, I felt out of place much of the time as I sought to make sense of my place in the world in light of what I believed. So that early morning it simply filled me up with joy and wonder to receive this visible sign of others who claimed the same 'citizenship' as I. Today although the pressures often seem somewhat less for me than they did when I was so young, it is still true that you and I are always out of place in this world. We have a ready parallel to this sense of 'out-of-placeness' whenever our journeys take us far from home, of course. Indeed, as much as I love to travel, whenever I venture far from home, my passport is always within reach, assuring a safe passage home. And when I finally close the door behind me after a long journey, I always do so with a sigh of relief, at the very least knowing that now I won't have to 'think so hard' to translate across time zones and cultures and languages. There is a certain vigilance that is required of those who are away from home and for all of the rewards of such journeys it is always good to leave it behind. I can't help but believe that this will also be so when we make that final journey home. Home to that place where all the wayward children know welcome, where no one will go to bed hungry, where all that divides us one from another will be destroyed. 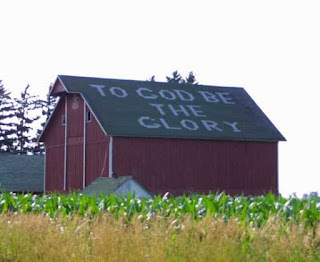 And so I wonder then, what it would look like if our every day was marked by our living as if this were so: to God's Own Glory, if you will --- as that barn roof would remind us. I wonder what it would be if all of us who have been claimed by and who have claimed for ourselves this citizenship did all we could even now to stand in God's place and wipe away the tears of those who weep. Indeed, I wonder what my 'citizenship in heaven' means today as I take my car in for repairs, pick up some groceries, meet a friend for lunch, tend to a few errands for my mother, and stand with a grieving family tonight. I do wonder, don't you? What does it mean to you that ultimately your 'citizenship' is in heaven? To your congregation? Besides those cited above, which other Biblical 'images' of heaven are especially meaningful to you? What do they offer about your 'citizenship' there? Does your 'citizenship in heaven' make any difference in terms of the decisions you make, the actions you take, the posture you hold? How does that 'citizenship' both extend a promise to you and place a demand on you at the same time? Pause to simply think through yesterday and today and tomorrow. What has it meant? What will it mean?